Tracy is visiting today from Mama Olie's Musings with a tutorial on how to recover a lamp shade. Hi! My name is Tracy and I blog over at Mama Olie's Musings. I want to thank Allison so much for the opportunity to guest post for her while she is making the move to a new home and new adventure in her life. First up...a little bit about me and my blog. I have 2 beautiful children and a wonderful husband who works very hard to support us while I hold down the home front. Mama Olie's Musings (formerly Cut it Out!) has evolved from a scrapbooking/crafting blog to a healthy mix of just about everything. I still share layouts and cards, but those are now mixed in with recipes, everyday life, my quest to learn how to use my camera, home decor and organization. This year I am on a mission to make my house a home (it is about time). I have found so many wonderful blogs that have given me inspiration and a push in the right direction. Someday (years from now) I will have that brand spankin new kitchen, finished basement, etc. etc. Until then, I want to be proud of my home so it is a DIY work in progress...on a budget. I have a long way to go, and the going is slow...but I would love for you to stick around for my journey. Lay the paper out flat on a table and place the lamp shade on the edge. I placed the seam on the edge of the paper for a reference point, however, you could always mark the lamp shade with your starting point if your shade doesn't have a seam. Begin rolling the shade onto the paper while tracing the top edge with a pencil. Continue doing this until you reach the seam or starting place again. Return the shade to the edge of the paper and begin rolling on the paper again, this time tracing the bottom edge. Cut out your traced pattern and pin to the wrong side of the fabric. Cut the fabric, following the pattern, but allowing at least a 1/4" margin on all sides. Remove the pattern. Spray the wrong side of the fabric with spray adhesive and begin placing it onto the shade, smoothing out any bubbles and wrinkles as you go. 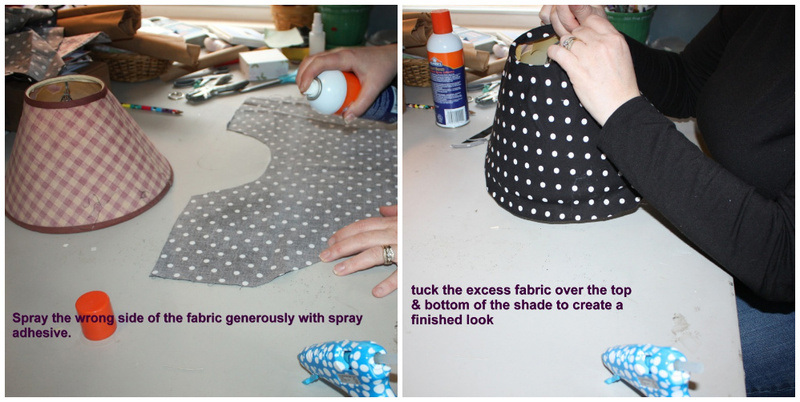 Tuck the extra fabric under the lampshade at the top and bottom. That is it. If you have a different type of lamp shade, there are numerous tutorials on the Internet showing the process for all different shapes of shades. I am not one to reinvent the wheel, a google search pulled up pages of tutorials, some with pictures and videos, some without. I found this one helpful when recovering my shade...although I am a visual type of girl so some pictures would have been nice. I love my "new" lamp! I want to thank Allison again for this opportunity. I hope you find the tutorial helpful. I would love for you to pop on over to my blog and visit me again. Adorable. I love the black and white! That is super cute... i love projects like this. I have some red checked material that will be just perfect for this. So cute! Love the black & white polka dot fabric! That is one CUTE little lamp! I love polk-a-dots!